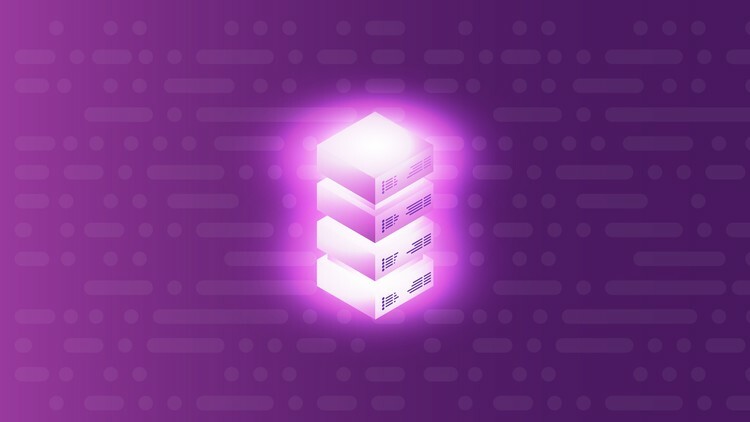 With In-Memory OLTP Simulator you can easily benchmark standard and custom scenarios of data workloads and processing against the powerful In-Memory OLTP Engine in SQL Server, get rich analytics and insights, and see how Memory Optimization in SQL Server can help you boost the performance of your data processes. This comparison is the main philosophy behind In-Memory OLTP Simulator. you get this comparison for all scenarios and Benchmark Mode. The Ultimate Edition offers even more insights regarding the comparison results. Run and change workload of six standard database process scenarios shipped with the tool (available in both Editions). In the Ultimate Edition, you can create your own custom scenarios, and thus simulate and compare the execution times for just about any database workload. In the Ultimate Edition of In-Memory OLTP Simulator, the user can generate an executive report regarding the simulation statistics and use it to better present her or his findings to Management. In the Ultimate Edition of In-Memory OLTP Simulator, you are presented with a rich set of export options for simulation statistics, executive report and scenario definitions. * This set of features is available only in the Ultimate Edition of In-Memory OLTP Simulator. Why we Built In-Memory OLTP Simulator and How Can it Help You? In-Memory OLTP Engine in SQL Server 2014 (and later) came to bring a revolution to performance of OLTP operations in SQL Server. With speedups that may reach up to 100x times faster than disk-based processing, it is for sure a technology that all of us should start use. We created In-Memory OLTP Simulator in order to make the whole process easier for you, and for us too! By using In-Memory OLTP Simulator’s wizards and workflow-based approach, you can simulate your own workload and run it against SQL Server’s In-Memory OLTP Engine, get rich statistics and insights and thus see in action how much you could benefit when using SQL Server’s In-Memory OLTP for your workload types. 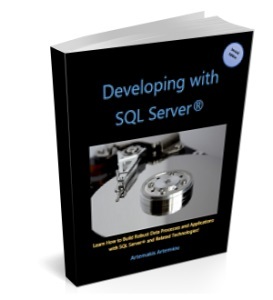 Never host In-Memory OLTP Simulator’s database on Production SQL Server® instances or Production servers. 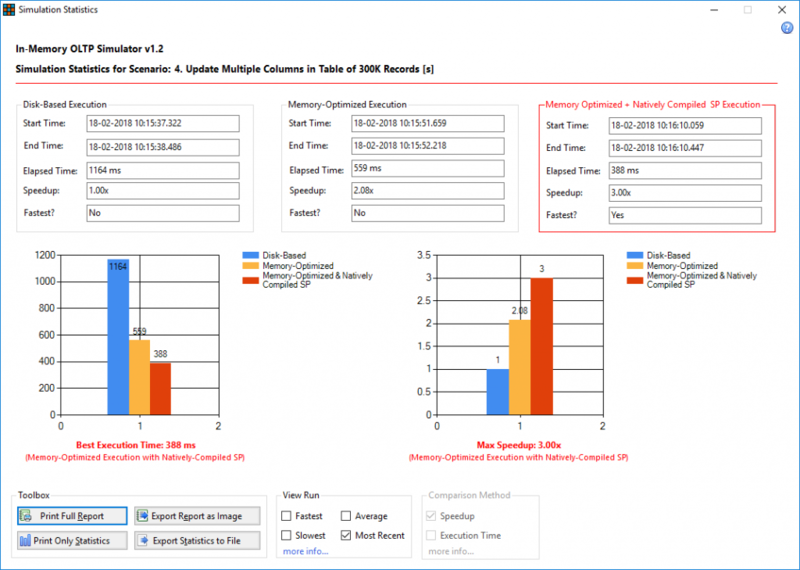 As the nature of the tool is to benchmark extreme simulations, you would risk the stability of your Production environment if you used it to host In-Memory OLTP Simulator’s database there. Use a Test server instead and in case you want to simulate Production workload you can copy the target data (i.e. via a linked server, SSIS, etc.) to the tables that will be created in Simulator’s database based on the definition of the custom scenario (custom scenarios can only be created in the Ultimate Edition of In-Memory OLTP Simulator). If you do not wish to use two different machines for running In-Memory OLTP Simulator (Database Server and Client PC), you can run In-Memory OLTP Simulator directly on the dedicated database server (not Production) that will be used for hosting the simulator’s database(s). 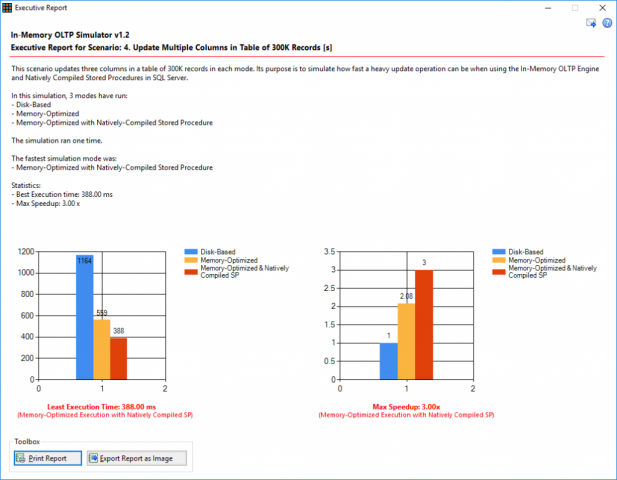 The trial version of In-Memory OLTP Simulator, allows you to use Benchmark Mode, as well as run standard simulation scenarios that ship with the tool. The trial version has limited functionality and expires 30 days after the first use of the tool. 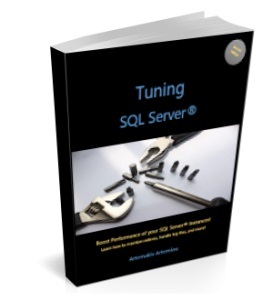 Using the free 30-day trial of In-Memory OLTP Simulator, you can assess and run basic workload against the powerful In-Memory OLTP Engine of SQL Server. Moreover, you might consider purchasing the Ultimate Edition of In-Memory OLTP Simulator and thus be able to create your own simulations, get more insights for your simulations, and much more! * In-Memory OLTP Simulator, up to version 1.1 was released under the brand name “SQLArtBits”. Purchase the Ultimate Edition of In-Memory OLTP Simulator and unlock all features and limitations. A single purchased license for In-Memory OLTP Simulator’s Ultimate Edition allows up to two (2) activations for different hardware configurations but only on the same computer. To this end, if you make extensive changes to your computer’s hardware, you can generate a new activation code and run the activation process again. This can only take place once. This means that the after you make use of the second activation (for the same computer), you will not be provided with additional free activations in case of further hardware changes to your computer. In such case, you will need to purchase a new license for the Ultimate Edition and perform a new activation (read the EULA for more info). 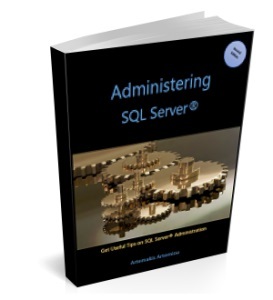 During the activation process, and after you enter the serial key that you were provided during your purchase of the Ultimate Edition license of In-Memory OLTP Simulator, you need to retrieve and submit to SQLNetHub an “Activation Code”. The activation code is a unique hardware hash (a hash is a numeric value derived through a mathematical formula and based upon some other, original value) that is created by running 2 different pieces of information from the computer’s hardware components (BIOS id, Mainboard id) through a one-way mathematical transformation. This means that the resultant hash value cannot be backwards calculated to determine the original values and it ensures complete anonymity. This process was developed in order to maintain the user’s privacy and it is only used to deter piracy. For more information and step-by-step instructions on how you can activate the Ultimate Edition of In-Memory OLTP Simulator after purchasing a license, please visit the online help topic “Special Topics: Activating the Ultimate Edition”. Last but not least you can find here In-Memory OLTP Simulator’s End-User License Agreement.